Harvest time at an Ambrosia orchard is an exciting time. There’s a special skill in getting the apples off the tree at just the right time, and ensure they stay as pristine as possible in the picking process. The first clue that Ambrosia apples are ready to pick is how they look. When they go from being green to having a combination of creamy yellow and rosy red flesh, they’re likely ready to harvest. But, growers don’t judge based on looks alone; they have to make sure they taste perfect too. To make sure their Ambrosia have the right flavour, farmers put their apples through something called a ‘maturity test’. This involves cutting a few apples open and checking the starch level. They spray an iodine mixture onto the cut apple. The iodine reacts with the sugar and starch – the sugar stays white while the starch turns black. A chart shows the exact amount of black that a perfectly mature Ambrosia apple should have. Once a grower has determined that his apples look ready and have the right mix of starch and sugar, it’s time to pick. Did you know there’s a special technique for picking Ambrosia apples? You want to grab the apple firmly but without squeezing. Don’t just tug the apple down; use a twisting motion to remove the apple from the tree. The stem should come off with the apple. 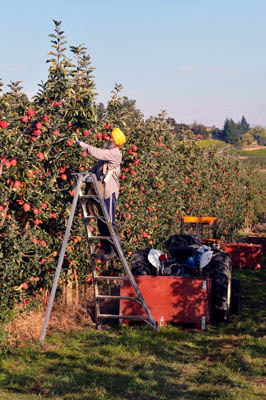 Professional pickers can usually pick two apples at once with both hands grabbing and twisting. They then place the apples gently into their sack making sure not to bruise them. 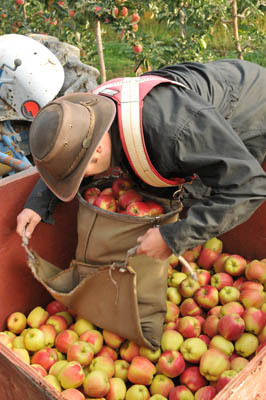 Once their sack is full, they release the apples from the bottom and carefully slide them all out into the bin. If you’re lucky enough to have an Ambrosia apple orchard near you, check to see if they offer U-pick. Visiting a farm and picking your own apples is a great way to spend an autumn afternoon. One more tip for picking Ambrosia apples – make sure you look up! Most Ambrosia apple trees are on a trellis system and grow very tall. Apples grow all the way to the top and sometimes the best apples are waiting for you to reach up and grab them!